The official Final Fantasy XV: Windows Edition benchmarks pages have been populated with results ranking the Nvidia GeForce RTX 2080 Ti and RTX 2080 at 1440p (high quality settings) and 4K or 2160p (standard/high quality settings). While we await verified third party tests and benchmarks for Nvidia's RTX 20 series this is a nice windfall to catch, via the OC3D Forums. Final Fantasy XV: Windows Edition was one of the first titles to be listed with support for Nvidia's DLSS. However, it isn't expected to support real-time raytracing (RTX On) anytime soon. To recap, DLSS is short for Deep Learning Super-Sampling (DLSS), a technology that applies deep learning and AI to rendering techniques, resulting in crisp, smooth edges on rendered objects in games. DLSS can be used as a refined alternative to Temporal Anti-Aliasing tech (TXAA) and Nvidia tests show it speeds up your frame rates as it shifts GPU processing load to the Tensor cores..
You can check the full set of benchmarks at the source benchmark.finalfantasyxv.com/result/ page. 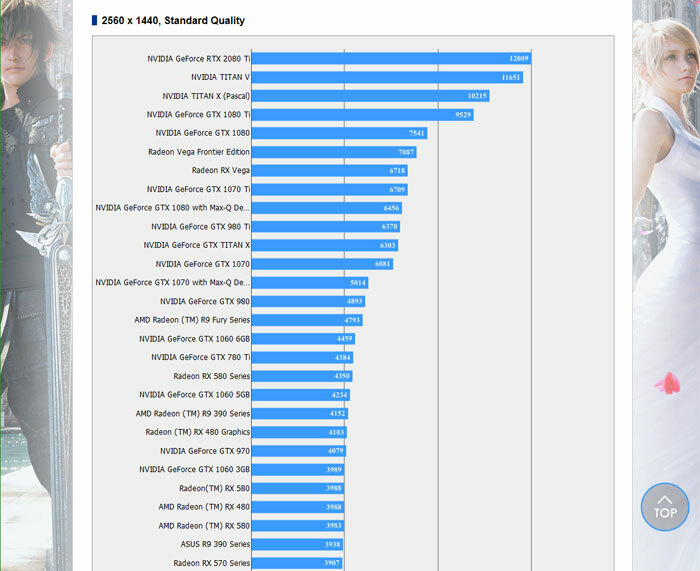 The first benchmark scores results, using lower resolutions and quality levels, don't include an RTX 20 Series card, you have to scroll down until you see the first tables with these cards appear at the 1440p Standard Quality level. Above and below I have embedded sample truncated tables showing the Nvidia GeForce RTX 2080 Ti and RTX 2080. 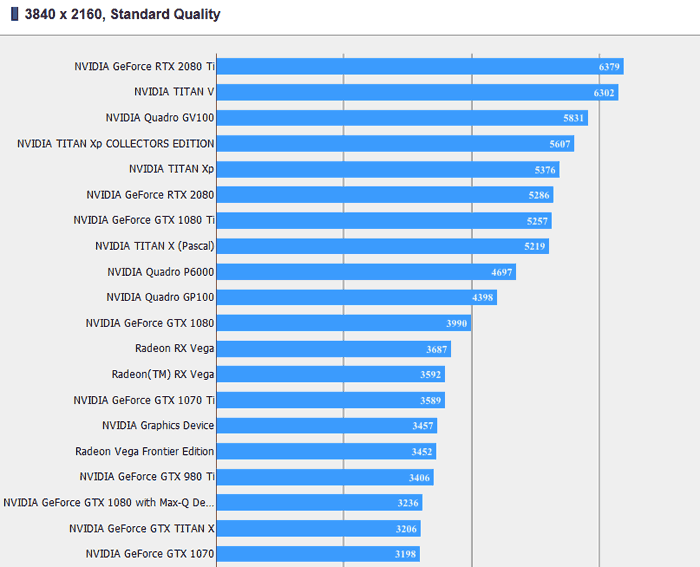 The new Nvidia graphics cards do extremely well in these benchmarks with the GeForce RTX 2080 Ti clearly in pole position above expensive enthusiasts GPUs like the Titan V and Xp. Meanwhile, the RTX 2080 stays a nose ahead of the GTX 1080 Ti in all cases. We know that using DLSS instead of TAA gives Nvidia's RTX 20 cards a big boost but according to the source report, DLSS isn't being used by the new cards in this test as the support isn't implemented yet. An RTX2080TI is just under 14% faster than a Titan Xp and 21% faster than a GTX1080TI?? This does not sound right at all?? nVidia's own benchmarking suite had the 2080ti at ~35-50% over the 1080ti at 4k, so 21% for a real world sample isn't hugely surprising. DLSS instead of TXAA might help if you're looking for effective 4k performance but that's it. These aren't superpowered cards. if I'd of pre ordered I'd be saying ouch ..